Great home in a gated community This freshly painted two story home is waiting for it's new home owner. Sparkling tile floors lead to the spacious living room with a cozy inviting fireplace. Living room is over looking a tranquil stream and beautiful flowers. The kitchen is open to a cozy dining area with sliding glass doors bringing in wonderful sunshine. Then we have a den downstairs and 3/4 bath. Up the winding staircase you will find a spacious master and one more bedroom. The vaulted ceilings and many windows give this home a very light and open feeling. Welcome to the community of Mill Stream in the beautiful Surf City USA. This well situated condo is beautifully upgraded throughout featuring an open floor plan, recessed lighting, crown molding, Travertine floors, and beautiful views of nature, lakes and streams. The updated kitchen boasts granite counter tops, rich wood cabinetry, wine refrigerator, breakfast bar and is open to the living and dining area. The master bedroom has a large walk-in closet, en suite bathroom, and sliding doors to a large patio overlooking the lush grounds. This unit includes convenient private laundry and a detached single-car garage. Mill Stream is a gated community offering amenities such as tranquil landscaping, a sparkling pool, spa, and tennis courts. Close proximity to the beach, schools, or the popular dining and shopping of Main St and Pacific City. Brace yourselves for this one! This 2 Bedroom [DUAL MASTER], 2.5 Bath home is an END-UNIT with NOBODY else ABOVE or BELOW, and tucked away quietly in the back. COMPLETELY RENOVATED throughout. Beautiful VINYL PLANK FLOORING flows throughout the first level making the space feel open and grand. KITCHEN FEATURES: white shaker cabinets, soft-close drawers with modern hardware, brand new stainless steel appliances, quartz countertop, breakfast nook, and breakfast counter. LIVING ROOM FEATURES: floor to ceiling brick gas fireplace, sit down views of the community landscape and water, and dining area next to the kitchen. This Millstream floor plan has a downstairs PATIO/seating area. Enjoy outdoor lunches or your morning coffee with some fantastic views. MASTER BEDROOM FEATURES: Very spacious sleeping area, tall beamed ceiling, wall to wall closet space, water views, and new plush carpeting. MASTER BATH: Separated dual vanity, tile flooring, and subway tiled shower. 2ND MASTER BEDROOM with its own upgraded bath/tub. ADDITIONAL FEATURES INCLUDE: 2-CAR GARAGE steps away from the front door, AC, recessed lighting throughout, association POOL and SPA. Yes, there's still more: Centrally located in Huntington Beach between the beach, restaurants, shops, Bella Terra, freeway, and some of the best HB activities around. Welcome home! Wonderful gated community, end unit, one common wall, no one above you, 2 car garage and plenty parking outside. This lovely condo has remodeled kitchen with quatz counters, beautiful wood floors, new cabinets. Spacious living room with cozy fireplace, and dining area. Inside washer, dyer hookups. Amenities with pool, spa, tennis court, duck pond, water stream. Great opportunity for family to be beach close. 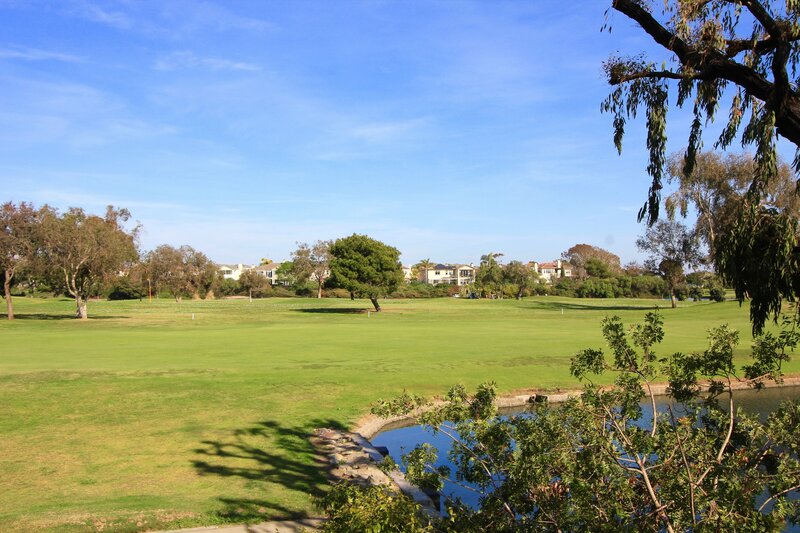 The private gated community of Millstream in Huntington Beach, California features charming condominiums that are enhanced by ponds, streams, wooden bridges, and waterfalls. Residents enjoy the peaceful atmosphere, while being within minutes of every modern convenience. The Millstream complex was built in the early 1980s with two and three bedroom condos ranging from 969 to 1,542 square feet of space. There are 129 units and all have private balconies or patios with outside storage. Two of the most popular features of these homes are the vaulted ceilings and skylights. Every home also has laundry rooms and one to two car garages. This neighborhood is situated along six small streets and you must have a key to gain entry through the two gates off Warner Avenue; car entry has remote access. You’ll hear the sounds of water throughout the community and units have views of the pool or tree tops. The public school system offers facilities such as College View Elementary School, Spring View Middle School, and Ocean View High School. Amenities include a swimming pool, spa, and lighted tennis court. Pets under 20 pounds are allowed and the Home Owners Association fee covers trash and water as well as earthquake and fire insurance. Millstream is within walking distance to restaurants, stores, and public transportation. The 405 freeway is less than two miles away and there are many centers in the region like the Bella Terra Shopping Mall. It features open-air shopping with stores like: Carters; Bed, Bath & Beyond; Costco, Kohl’s; and Old Navy. It also has movie theaters and services for eyes, hair, nails, body treatments, jewelry, and banking. Huntington Beach is known as “Surf City” because of its amazing swells that bring in surfers from around the world. There are many water activities like fishing, swimming, rowing, and paddle boarding in the ocean and nearby bay. If you’re already working with a Real Estate agent, please utilize your agent’s website & direct expertise to aid in your home search. We are only able to directly serve our own clients. Thank you for your interest in the Millstream community, and we wish you the best of luck with your Real Estate needs. Whether you are contemplating buying or selling a home in Millstream, it is important that you hire the right team that fits your needs. We roll out the red carpet for buyers & sellers alike, and ensure you have access to us 24/7, as we aim to earn your business for life! We understand the market well, and you will not find a more qualified Millstream real estate agent to help you with all of your Real Estate needs! As a buyer, you will have access to Millstream listings the second they hit the market, which gives you a leg up on the competition. As a seller, your home not only will be featured on one of the top Millstream sites on Google, but we also will syndicate your home to hundreds of other sites, hold weekly open houses, send out postcards, and much more! We have helped dozens of buyers & sellers, and look forward to helping you as well! Newly listed as of Friday, April 19th at 8:07am, this 2 bedroom, 2 full baths, 2 half baths home on Westwood Lane is part of the Millstream community. With 1,520 square feet of total floorspace, this home is priced at &dollar;345.07 per square foot. That's 11.88% lower than the neighborhood average. There are also 1.00 garage spaces available for parking. Listing provided courtesy of Ruth Porter at Port Realty.